FIGURE 1 ■ The anterior abdominal wall. 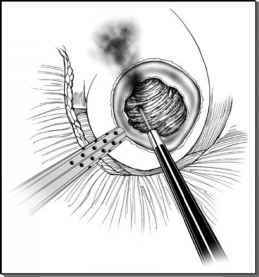 The peritoneal circulation plays a major role in the exchange of fluid and solutes draining peritoneal dialysis. abdominis muscle). The parietal peritoneum is the innermost layer of the abdominal wall. It is a thin layer of dense, irregular connective tissue and is covered on the inside by a layer of simple squamous mesothelium. The peritoneum provides little strength in wound closure, but it affords remarkable protection from infection if it remains uninvolved. The rectus muscles are each contained within a facial sheath, which is derived from the aponeurosis of the three flat abdominal muscles. Below the semicircular line, which is the point at which the inferior epigastric artery enters the rectus sheath, the posterior rectus sheath is lacking because the fascia of flat muscles pass anterior to the rectus muscle. A thin layer of the transversalis fascia covers the muscle, below the semicircular line, posteriorly, which is usually transparent when viewed from the inside at operation (3-5).